edTPA is a performance-based, content-specific assessment process designed by educators to determine whether new teachers are ready for the job. 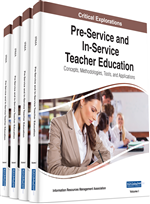 This chapter provides a thorough description of how two departments at the University of North Carolina implemented edTPA in teacher licensure programs and how candidates were supported through the process. Elementary, Middle Grades, Secondary, Teaching English as a Second Language, and Foreign Language Education programs are described and implementation details of edTPA are provided. Formative supports for each program are presented. Finally, the chapter discusses future directions and next steps. Three years ago, teacher education programs in North Carolina were offered the opportunity to participate in a pilot of edTPA. Seven institutions decided to take this opportunity to learn more about edTPA and how it would work in their teacher education programs. By participating in the pilot, institutions received support from the state department of public instruction. The University of North Carolina at Charlotte was one of seven institutions that made the decision to become involved in the pilot of edTPA. UNC Charlotte was interested in learning more about this research-based, performance-based assessment and was looking to implement such an assessment to determine readiness of its teacher candidates. Other appealing features of edTPA included its direct alignment with state and national standards, including Common Core State Standards and Interstate Teacher Assessment and Support Consortium as well as its reliability and validity. While this was a pilot, Institutions of Higher Education (IHEs) had flexibility in how they would integrate edTPA and how they would offer various edTPA supports throughout their academic programs. Initially faculty began planning for integration of edTPA tasks in early coursework to introduce teacher candidates to the edTPA process early in their academic programs. Planning for edTPA began three years ago. Faculty began reviewing existing coursework to determine what types of formative supports could be offered and in which courses these formative assessments could be embedded. During the 2013-2014 academic year, several programs, including Elementary Education, Middle Grades Education, Secondary Education, Foreign Language Education, and Teaching English as a second began implementing edTPA formative supports into early coursework. This provided an opportunity to determine what worked and what did not so that any revisions to formative supports could be made. In Fall 2014, Elementary Education, Middle Grades Education, Secondary Education, Foreign Language Education, and Teaching English as a Second Language candidates completed a full edTPA portfolio during the student teaching semester. During Spring 2015, other programs such as Special Education and Early Childhood completed a full edTPA portfolio during the student teaching semester. As of Fall 2015, all teacher licensure program candidates complete an edTPA portfolio and submit it to Pearson for external scoring.